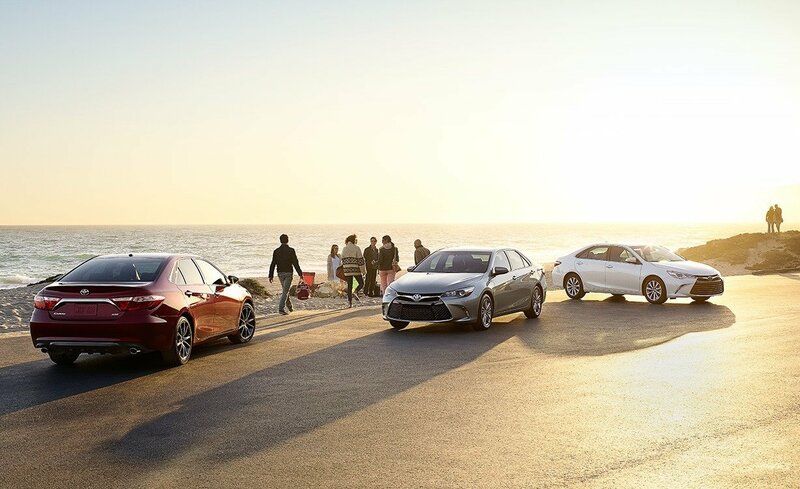 Meet the 2017 Toyota Camry Family! For many years, drivers throughout Pooler and Bluffton have relied on the Toyota Camry as a dependable and affordable way to get around. Now, the entire 2017 Toyota Camry lineup has arrived at Savannah Toyota, and there’s plenty to be excited about. From standard Entune™ infotainment to available heated leather seats, there are numerous features among the new Camry trims that are sure to please. Find out more here, and then visit Savannah Toyota to test drive your favorite model. While being an affordable entry point into the Camry lineup, the LE trim still comes standard with an Entune™ touchscreen interface, a rearview camera display, a six-speaker sound system, and Bluetooth® connectivity. Looking for more responsive performance? Then move up to the Camry SE, and get a sport-tuned suspension, steering wheel-mounted paddle shifters to control gear shifts, larger wheels, and sport exterior styling. The Camry XSE comes with the newest Entune™ infotainment system, which includes smartphone app integration and a navigation system, as well as satellite and HD Radio. As the most luxurious trim in the Camry lineup, the XLE enjoys heated front seats and soft leather upholstery, with V6 models also getting keyless entry and push-button start. While the above highlights offer a first look at what’s on offer inside the Camry, they’re far from the full picture. The Camry’s base engine is a 2.5L inline-four, but the top two Camry trims are also offered with a 3.5L V6 that produces 268 hp. You’ll also find available features like the Toyota Safety Connect® telematics system, a wireless smartphone charging station, a leather-wrapped steering wheel, and much more! When you’re ready to take the next step, the team at Savannah Toyota is here to help! We have a full lineup of 2017 Camry models available right now at our dealership, which is located at 11101 Abercorn Street in Savannah, GA, just a short drive from both Pooler and Bluffton. Our lot and showroom are open Monday through Saturday for your convenience, and you can always contact us with questions at (855) 411-6139.